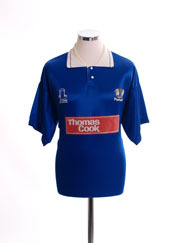 Peterborough were formed in 1934 when they wore green shirts, but ever since 1937 The Posh have worn predominantly blue shirts, usually trimmed or complimented with white. UpThe Posh! The Peterborough United Database http://www.uptheposh.com/	A site dedicated to researching and documenting the history of Peterborough United Football Club.